Set in the Yangtze Delta in the wake of the Sino-Japanese war, Spring in a Small Town is a beautifully mesmeric drama that transcends its basic love triangle plot. I was reminded of David Lean’s Brief Encounter, only here the encounter is not so brief as the conflict between desire and duty extends over several days. The film opens with a shot of the central female character, Zhou Yuwen (Wei Wei), walking by the ruins of the city walls, which give a view across miles of countryside. In hypnotic tones, she narrates the story, providing us with a context for what follows. Zhou lives with her husband Dai Liyan (Shi Yu) in the war-ravaged ruins of Liyan’s grand family home, together with Lyan’s teenage sister Dai Xiu (Zhang Hongmei) and their servant Lao Huang (Cui Chaoming). 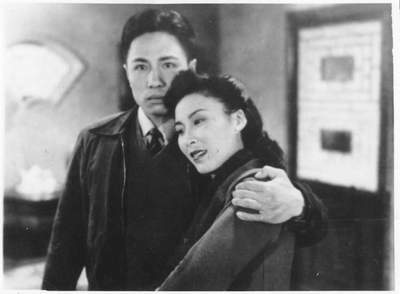 Liyan claims to be suffering from tuberculosis, though Zhou believes he is neurotic – clearly, he is depressed about the loss of his family’s wealth which, as he puts it, happened “on my watch”. Zhou and Liyan occupy separate rooms, barely speak to each other, and the latter spends most of his days sitting unhappily in the garden. Zhou comments that she “does not have the courage to die” whereas Liyan “does not have the courage to live”. Xiu is the only real life in the household. Approaching her sixteenth birthday, she has less connection to the family’s past and so views the future with optimism. This stasis is exploded with the arrival of Liyan’s old friend Zhang Zhichen (Li Wei). The two have not seen each other for ten years, during which time Zhichen has become a doctor, working in “the interior”. Liyan is ennervated by his friend’s arrival but, crucially, it is clear to the viewer that Yuwen and Zhichen were formerly lovers. More than this, their passion for each other has not dimmed. When the entire family go on walks along the city walls, or down the river by boat, Yuwen and Zhichen exchange glances and momentarily touch hands. On the occasions when they manage to be alone together they agonise over their plight but, Hamlet-like, neither can commit to decisive action. The film never comes close to melodrama. Rather, the whole thing has a dream-like quality to it, perhaps reflecting the delirious state of people in the grip of romantic love. Zhou’s narration is one contributory factor to this atmosphere, her tones becoming particularly hushed and breathy when she is describing what is happening now as opposed to in the past. Another factor is director Mu Fei’s use of dissolves within darkened interior scenes. The psychological tension is ramped up when Liyan decides that Zhichen would be a good husband for Xiu. The latter takes walks with Liyan along the city walls. At one point Liyan asks her why the family always choose to walk there. She tells him “When you look so far into the distance that you can’t see anything at all, you start to realise that the world isn’t so small after all”, adding that it would be very easy to suffocate within the confines of the family home. The drama reaches its height when Liyan falls ill. This episode raised several questions in my mind, which are still puzzling me. Having realised that his wife and friend are in love, Liyan pays a solitary visit to Yuwen’s bedroom. He sits on the side of her bed, reaches across and touches her pillow, but this action seems to make him cough, whereupon he takes a seat by the side of her bed with a look of concern on his face. What is the significance of this scene? It is as though Yuwen is allergic to his wife. Is that coughing attack a coded reference to Liyan being either gay or impotent? Liyan returns to his own bedroom where we seem him drinking more than one cup of tea. There are also medicinal-looking bottles by the tea urn. He goes to bed, whereupon he slips into unconciousness and is discovered in this state by the servant. But what causes him to become unconscious? Is it purely psychological? Has he overdosed on some medicine? Or has he aggravated his heart by drinking excessive quantities of tea. It is not entirely clear. When Yuwen is brought to see him I thought I noticed a fleeting smile cross her face, but this is quickly replaced by a look of concern and a return to duty. According to Noah Cowan’s article about Spring in a Small Town in the July issue of Sight & Sound, Fei Mu saw himself as a promoter of Confucian values. To the extent that these are reflected in this film, it is perhaps that everybody tries to do their duty. This leaves us with a curious ending in which Xiu and the family servant see off Zhichen as he returns to the interior. By now, Xiu nows that Zhichen is in love with her sister-in-law, but she asks him when he will return. He tells her he will be back in the spring, whereupon she suggests he return in the summer. We then see Yuwen standing on the ruined city walls staring out into the distance. Liyan approaches her and she points out something in the distance to him, bringing to mind Xiu’s earlier words that this view reminds us that the world isn’t so small after all (perhaps recalling Humphrey Bogart’s words in Casablanca, that “the problems of three people don’t amount to a hill of beans in this crazy world”). Spring in a Small Town is currently being shown in an extended run at the British Film Institute at London’s South Bank, and is also available on the BFI Player.